A hoard of silver coins minted during the reigns of Henry VIII and all of his children has gone on display in the Ludlow Museum at The Buttercross in Shropshire. The coins were discovered by three metal detectorists in November of 2015 who reported their finds to the Portable Antiquities Scheme. 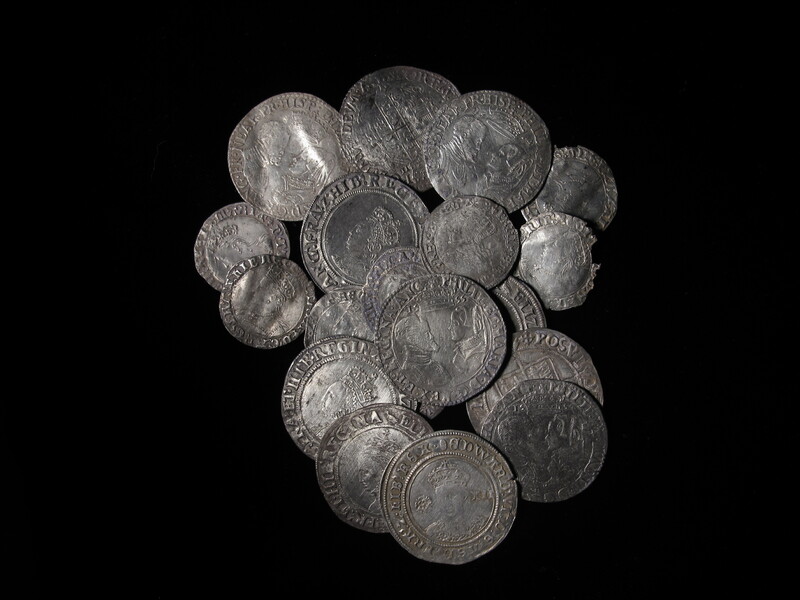 The hoard was declared treasure and after a campaign that secured funding from the V&A Purchase Grant Fund, the Headley Trust and Friends of Ludlow Museum, in 2018 it was acquired by the Shropshire Museum Service. The hoard is a small one of just 20 coins, likely the contents of a single purse. The finders noted that the coins were found close together in the top soil, evidence that they had spent most of their underground life in a container before being scattered and the container lost or degraded beyond recognition. The coins are sterling silver, following the standard for coinage of their era. One of them is a fragment of a coin from the late reign of Henry VIII or to the beginning of the one of his son Edward VI, struck in posthumous honor of Henry VIII. Some of the breaks are modern, suggesting there may be more of the broken coin at the find site. The rest are intact and in similar condition of wear and corrosion. Several bear diagonal scratch marks left during an attempt at cleaning. They were probably individually selected by the collector to match the patina. The pattern of wear and tear on the coins suggest they were in circulation at the same time and little wonder given how high the Tudor turnover was between the end of Henry VIII’s reign and the beginning of Elizabeth I’s. They were all struck between 1544 and 1561 during the reigns of Henry VIII, (1509-47) Edward VI (1547-1553), Mary I (1553-1554), Mary I and Philip of Spain (1554-1558) and Elizabeth I (1558-1603). 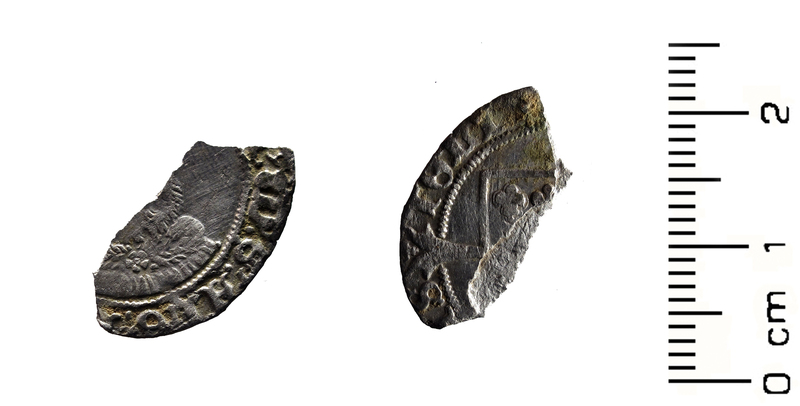 The fragment is a silver groat of Henry VIII/Edward VI, one silver shilling of Edward VI (1551-53), five silver groats of Mary (1553-54), five silver shillings of Mary and Philip (1554-58), two silver groats of Mary and Philip, five silver shillings of Elizabeth I and one silver groat of Elizabeth I. The date of the most recent coin in the hoard suggests it went to ground during or shortly after 1561. After four monarchs in 11 years, there would have been little reason to expect Elizabeth’s reign to be as long and stable as it became. In times of political turmoil, cash tends to get hidden. The hoard has a face value of 14 shillings (or the equivalent of a labourer’s salary for around three weeks). The coins can be seen at the Ludlow Museum on Friday, Saturday and Sunday between 10AM and 4PM. Entry is a token £1 for adults. This entry was posted on Monday, December 17th, 2018 at 11:58 PM	and is filed under Ancient, Museums. You can follow any responses to this entry through the RSS 2.0 feed. You can skip to the end and leave a response. Pinging is currently not allowed. Isn’t Prince Arthur the older brother of Henry VIII so son of Henry VII? What was the current-day value of the hoard?